THE COMPOSER of the Romantic period believed that music should “express” something. As so often in preceding periods, extramusical tendencies, such as poetic and dramatic subjects, emotions, actions, and even philosophical problems of Weltanschauung (philosophy of life) had become influential. These tendencies caused changes in every feature of the musical substance. 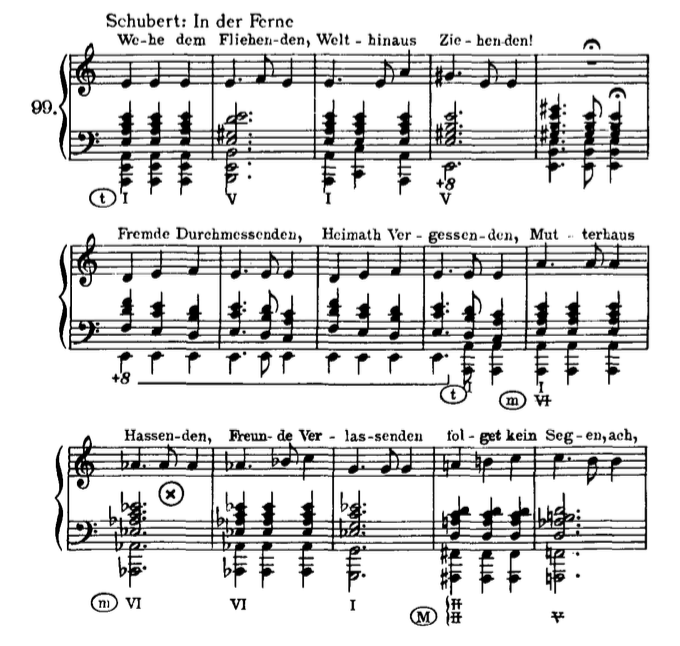 Alterations in the constitution of chords decisively changed the intervals of the melodies and also resulted in richer modulations; the rhythms and dynamics of the accompaniment, and even of the melody, symbolized their extramusical objects instead of deriving from purely musical stimuli. 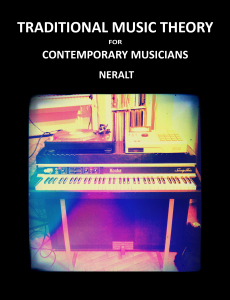 The origin of these new features may be debatable aesthetically, if not psychologically; however, whatever the source of the musical inspiration may have been,it resulted in great developments. In descriptive music the background, the action, the mood and the other features of the drama, poem or story become incorporated as constituent and formative factors in the musical structure. Their union thereafter is inseparable. Neither the text nor the music conveys its full significance if detached from its companion. Their union is an amalgamation comparable to an alloy whose components can be separated only by complicated processes. 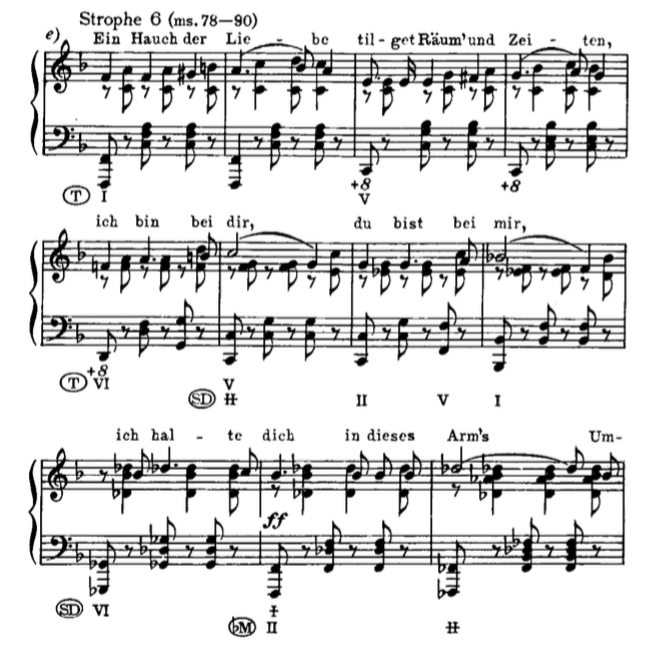 Drama and poetry are greatly inspiring to a composer. But much of what they evoke on the one hand, they revoke on the other. 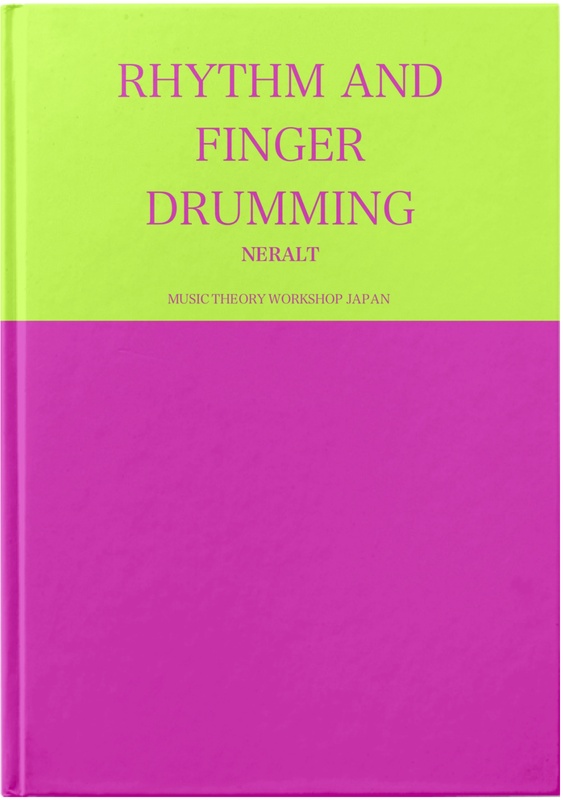 A melody, if it followed the dictates of its musical structure alone, might develop in a direction different from that in which a text forces it. It might become shorter or longer, produce its climax earlier or later — or dispense with it entirely — require less striking contrasts, much less emphasis, or much less accentuation. Besides, the text is frequently so overwhelming in itself as to conceal the absence of value in a melody. 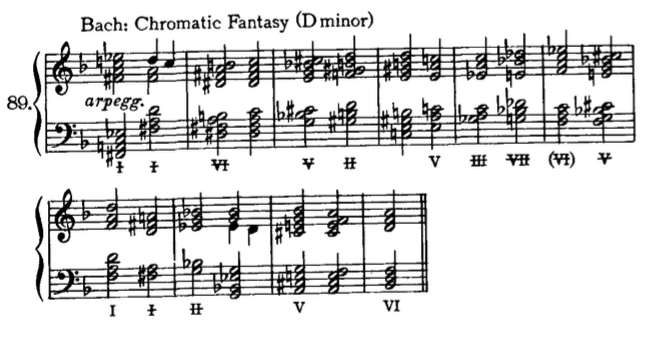 These extramusical influences produced the concept of extended tonality. 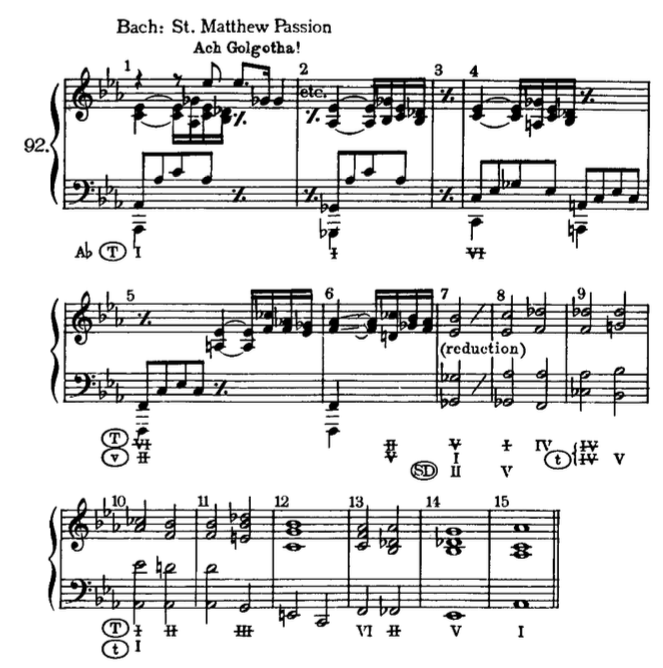 Remote transformations and successions of harmonies were understood as remaining within the tonality. Such progressions might or might not bring about modulations or the establishment of various regions. They function chiefly as enrichments of the harmony and, accordingly, often appear in a very small space, even in a single measure. Though referring them to regions may sometimes facilitate analysis, their functional effect is, in many cases, only passing, and temporary. 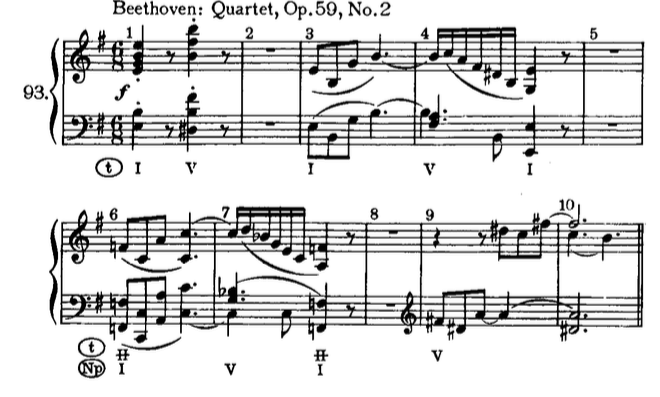 In the beginning of the Prelude to Tristan, V of a minor is followed by two modulating sequences (see Ex. 85a), the last of which prepares for the recurrence of the opening V (ms. 16). 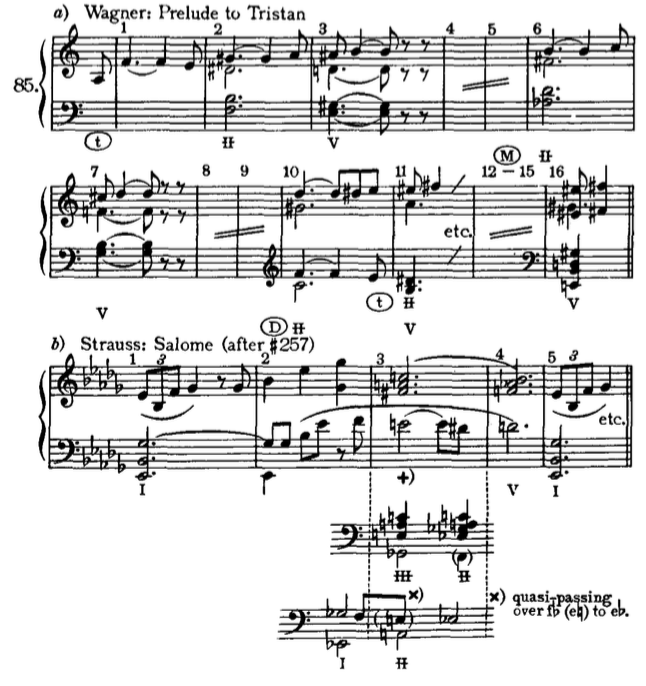 In 85b, from Strauss’ Salome, ms. 3 (at +) a harmony appears which seems difficult to explain. 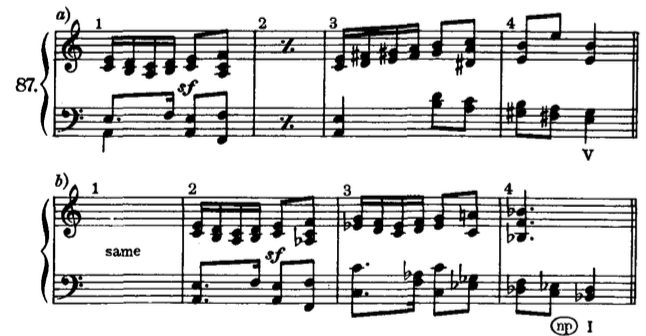 But if one considers the e♮ as a mere passing note, connecting the f with the d# (eb), it becomes clear that it is a diminished seventh chord of Ⅱ, sounding much more remote here. 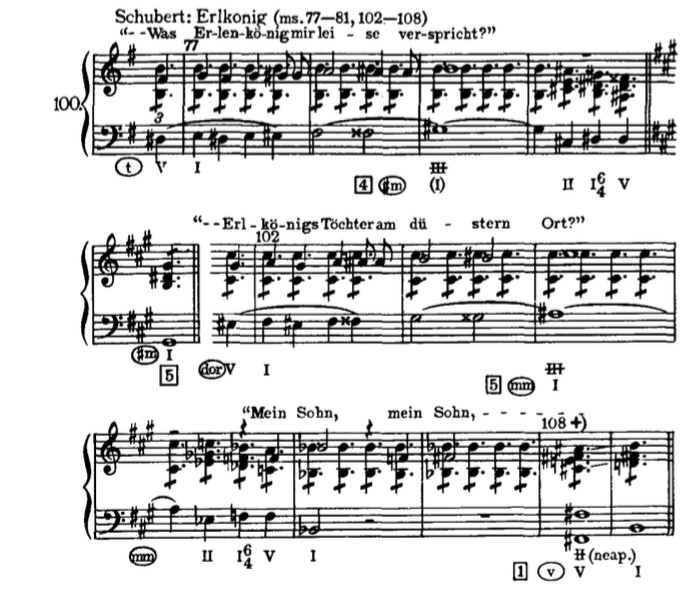 However, far-reaching deviations, resulting from remote progressions, occur frequently in Brahms. 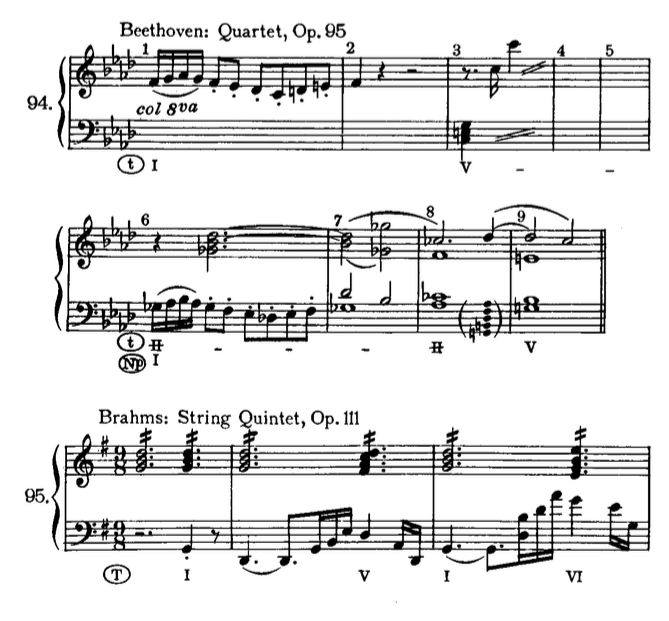 In the C minor String Quartet, Op. 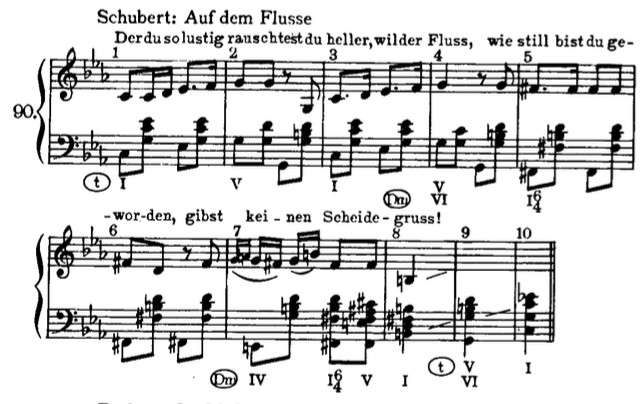 51, first movement, the contrasting middle section ends on the tone f# (ms. 21), which must undoubtedly be analyzed as V of dominant’s mediant minor (Dm), an extremely remote point scarcely appropriate to reintroduce I of c minor. 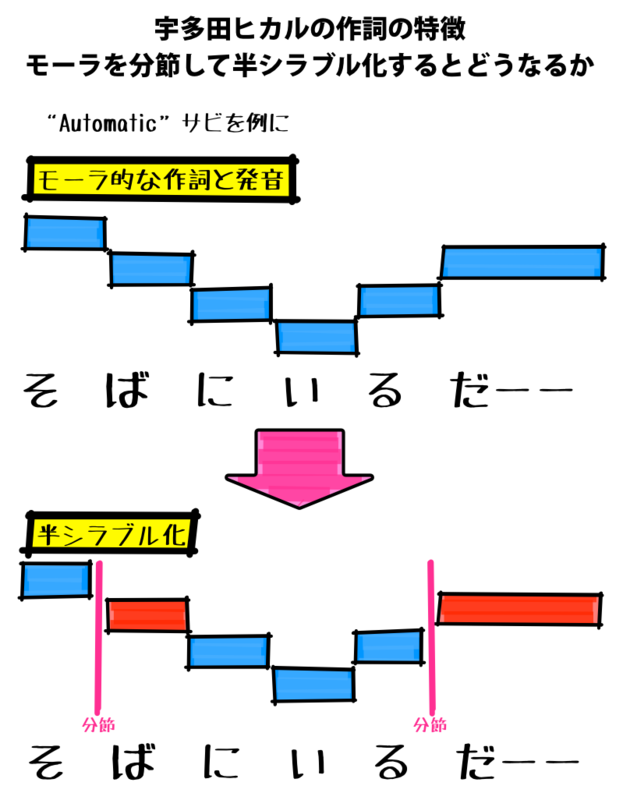 A little unaccompanied fragment then serves as a retransition to t (Ex. 86a). 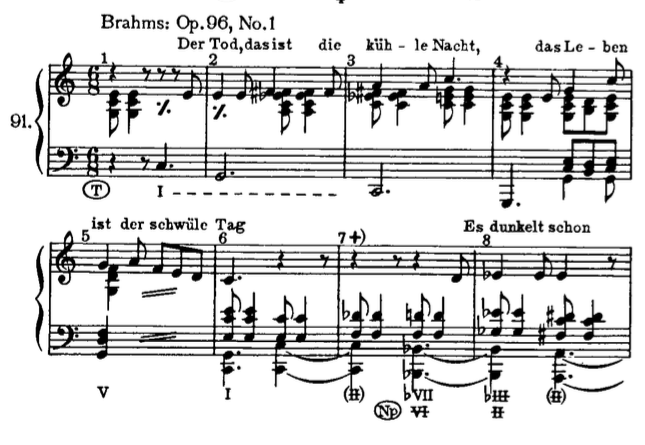 If Brahms were not a profound thinker and a great virtuoso in the treatment of harmonic problems, he would simply have repeated this procedure in the recapitulation. But in order eventually to recapitulate the subordinate theme in t he shifts the al sectionl, ms. 23, to sd, a fifth below (86b). 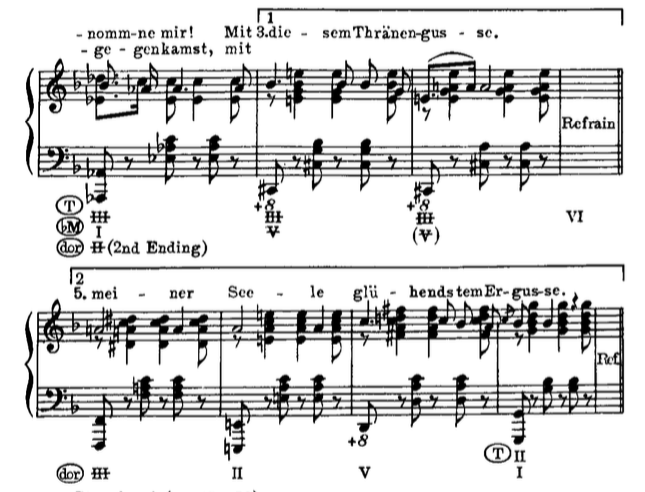 Accordingly the tone which precedes the little fragment of ms. 22 should have been transposed similarly, i.e. to B. But instead of that he arrives at E, the V of #SID, and requires two more modulatory measures for the introduction of sd. be employed in the Durchfiihrung (” zu den B-Tonarten “, he said). 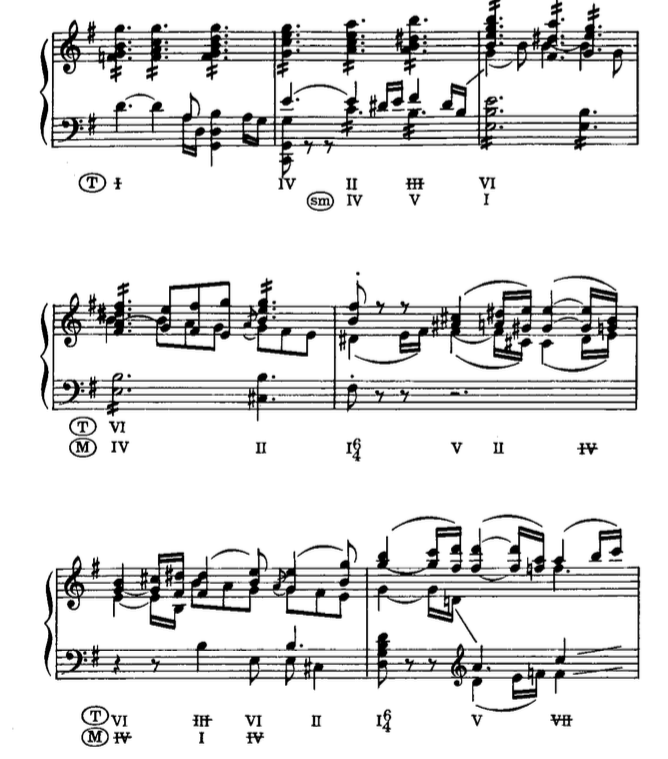 In the works of earlier composers many passages of extended tonality are to be found. Ex. 88 and Ex. 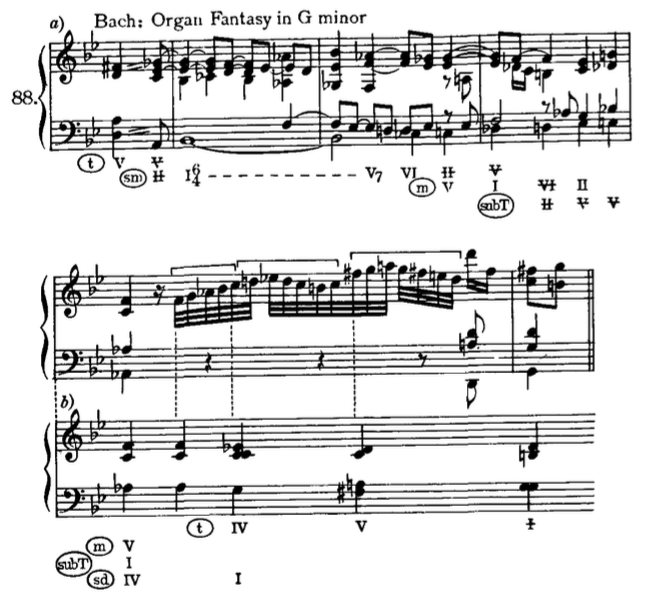 89 from Bach’s G minor Organ Fantasy and from the Chromatic Fantasy are composed of such remotely related transformations. 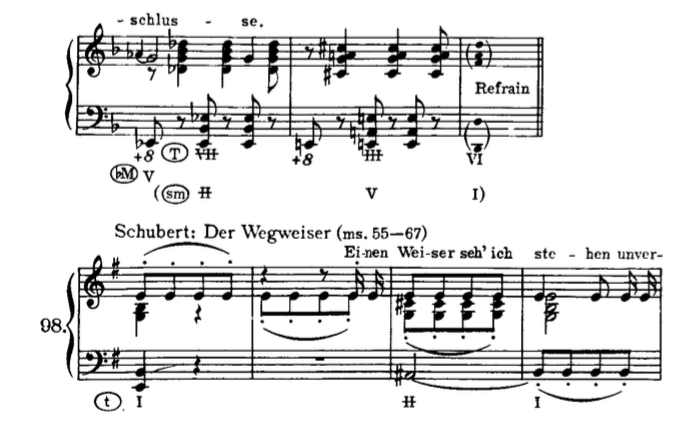 Deviation into remote regions often occurs in descriptive music, even in “establishing ” [expository] sections. Songs, operas, choral works and symphonic poems take advantage of the emotional expressiveness of extravagant modulations. 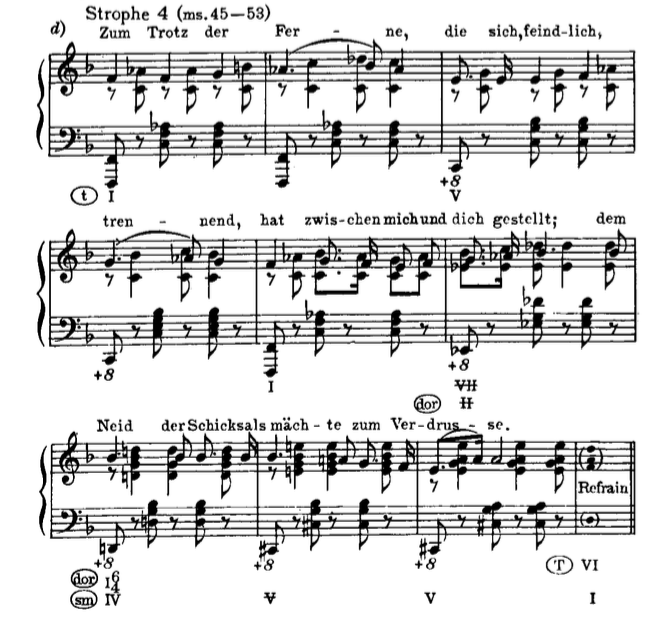 See, for instance, the two examples, 90 and 91-” Auf dem Flusse” by Schubert and” Der Tod, das ist die kuhle Nacht” by Brahms-and the little recitative from the St. Matthew Passion, Ex. 92, to the words” Ach, Golgotha “. 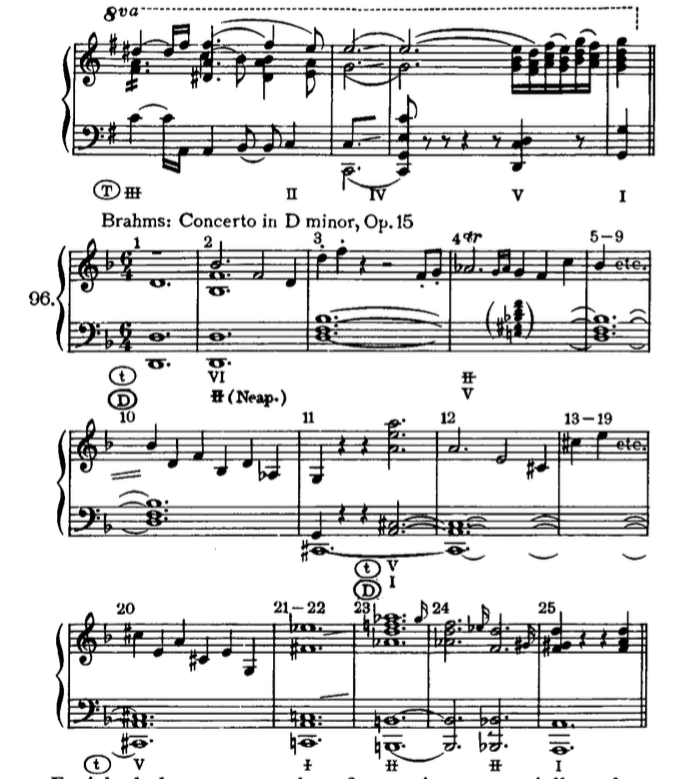 the Piano Concerto in D minor (Ex. 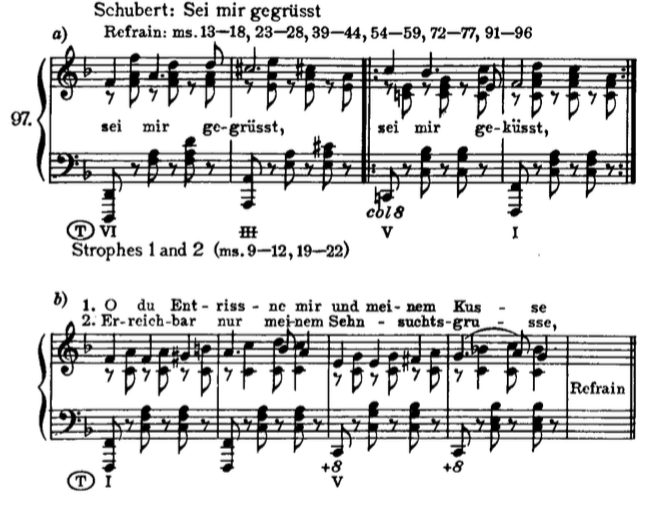 96), both by Brahms. 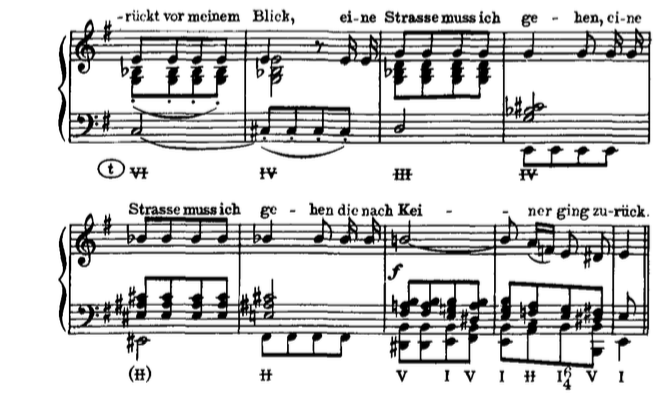 progressions, as in “Der W egweiser” (Ex. 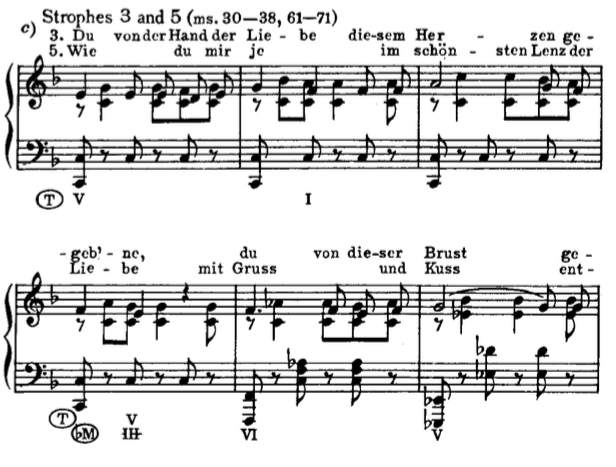 98), or abrupt modu- lations, as ms. 18 of “In der Feme” (Ex. 99) and in ” Erlkonig” (Ex. 100).